The secure and reliable Grandstream UCM6200 series delivers enterprise-grade features without any licensing fees, costs-per-feature or recurring fees. 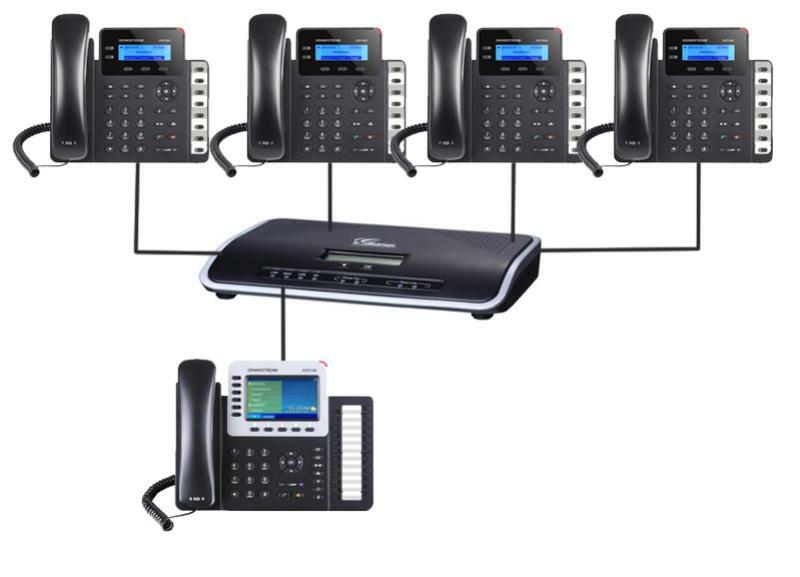 Included are four of the Grandstream GXP1628 standard IP phones for small businesses, this Linux-based model includes 2 lines, 3 XML programmable soft keys, 8 BLF keys and 3-way conferencing with 10/100M network ports and integrated POE support. In combination with our most powerful Enterprise IP Phone, the Grandstream GXP2160 is a Linux-based device with 6 lines, 5 XML programmable soft keys, 5-way conferencing. HD audio and a 4.3" colour LCD screen. Create high quality calls, with the 24 BLF keys, Bluetooth, USB and EHS support for added versatility. This is ideal for a telephone attendant / reception desk to ensure maximum office productivity by efficiently monitoring and dispatching multiple incoming calls. Utilising features such as Call Park/Pick-up, Speed Dial, Presence, Intercom, and conference/ transfer/forward.